Add cereal and stir until well coated. Using buttered spatula or wax paper evenly press mixture into 13 x 9 x 2-inch pan coated with cooking spray. Top with sprinkles liberally and cool. Cut into 2-inch squares. Best if served the same day. In microwave-safe bowl heat butter and marshmallows on HIGH for 3 minutes, stirring after 2 minutes. Stir until smooth. Follow steps 2 and 3 above. Microwave cooking times may vary. Sometimes the simple things in life are the best. I love the addition of sprinkles! These are so cute! They'd be perfect for a birthday party. Cuteness. Those look like they are ready for a party! They look so colorful which makes me want them even more. Great recipe. I never realized you could make them with the microwave. Love it! Thanks for sharing. these are DH's fav treat! I can't remember when I had one of those. Boy, did I love them. I love the sprinkles on top. We just made some of these and usually put colored sugar on top of them.. Next month, when we make them, we'll have them with these kind of sprinkles. 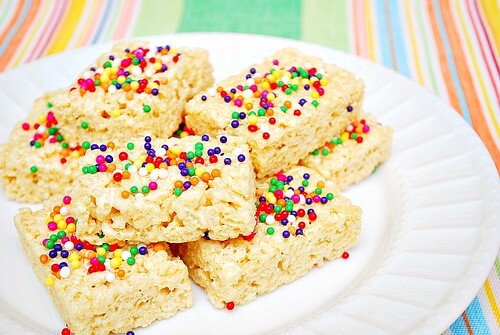 My favorite way to make these is with cheerios instead of rice krispies and peanut butter added... yum yum yum! These seem so bright and colorful. Taking the ordinary a step above.